My own ABCs consist of places I have loved (Iceland, Patagonia, Quebec), things I feared (Earthquakes), writers I have admired (Chesterton, Balzac, Proust, and Borges); locales associated with my past life (Cleveland and Dartmouth College), people who have influenced me (John F. Kennedy), foods I love (Olives), and things I love to do (Automobiles and Books). This blog entry is my own humble attempt to imitate a writer whom I have read on and off for thirty years without having sated my curiosity. Consequently, over the weeks to come, you will see a number of postings under the heading “Tarnmoor’s ABCs” that will attempt to do for my life what Milosz accomplished for his. To see my other entries under this category, hit the tag below marked “ABCs”. I don’t guarantee that I will use up all 26 letters of the alphabet, but I’ll do my best. Today the letter is “S” for Scotland. When I write about the places I love most, Scotland ranks high on my list. I have been there four times, but have barely scratched the surface. Twice I went with Martine, who liked it as much as I did. To this day, she still wears the Cardigan sweater she bought at a woolen mill near Oban, and I still have two Scottish sweaters I bought almost forty years ago, which I still wear occasionally even though they are starting to pill a bit. Nowhere else in the British Isles are you likely to get as tasty food as in Scotland. Scots are typically friendlier than the folk south of Hadrian’s Wall—probably because they know so many Americans have Scottish blood flowing in their veins as a result of the Highland Clearances that took place after Culloden. What really distinguishes the Scots in my mind is their sense of history. There’s not only the rebellion of 1745, in which the Highlands wasted their manpower for the unworthy Bonnie Prince Charles, but going farther back, back to Somerled and the Lords of the Isles, William Wallace and Robert the Bruce, the struggles of the House of Stewart to establish themselves, the great tragedy of Flodden Field, the death of Mary Queen of Scots, the cruelty of Butcher Cumberland, and that brave late 18th century renaissance that brought so many Scottish thinkers and inventors to the fore. As with Hungarians, the Scots live the entire spectrum of their history. Edinburgh is probably one of my two or three favorite cities in the world, especially that long walk downhill along the Royal Mile from Edinburgh Castle to the Palace of Holyroodhouse, and then the climb of Arthur’s Seat to see “Auld Reekie” in all its glory. 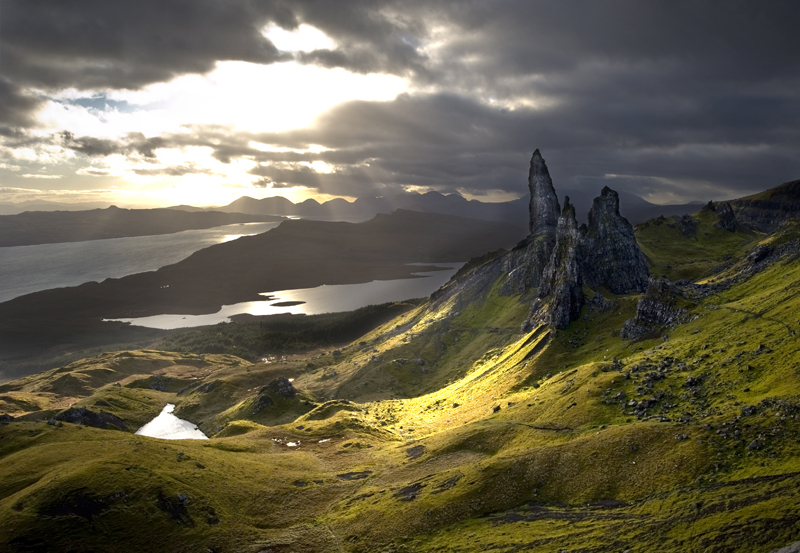 But if you really want to see Scotland, go for the isles, for Mull, Iona, Islay, Skye, and the Orkneys. When you walk among the graves by the church at Iona, remember that Macbeth and a score of early Scottish kings are buried there in unmarked graves. Martine and I have looked for the Loch Ness Monster at Drumnadrochit. (We didn’t see it.) We visited castles, Scotch whisky distilleries, ate haggis and neeps (at least, I did), and enjoyed a bowl of cullen skink. Then were all those novels by Nigel Tranter and Sir Walter Scott, not to mention the poems of Robert Burns, whose museum I saw at Dumfries. Och, it’s time to go back!